Frankie (Scoot McNairy) and Russell (Ben Mendelsohn), two cocksure yet inexperienced crooks, are hired by Johnny (Vincent Curatola), aka The Squirrel, to carry out a hit on a local high-stakes poker game being run by Markie Trattman (Ray Liotta), a mob boss known for robbing one of his own games in the past. Figuring they’re covered, Frankie and Russell return to their respective lives, unaware that enforcer Jackie Cogan (Brad Pitt) has been called in by an unknown middleman (Richard Jenkins) to clean up the mess in any way necessary. What’s a fairly conventional narrative is undercut by a fairly substantial, politically-orientated social commentary that becomes Killing Them Softly’s dominant anchor. It’s an interesting technique, particularly in the way writer-director Andrew Dominik has transposed George V. Higgins’ original source material to a part of modern America that’s in deep, poverty-stricken recession. In doing so, Dominik cleverly underpins the story – in addition to the characters and their respective motives – in a particularly authentic sense of reality. The almost satirical news bulletins that are mixed in with the narrative may take the political subtext one step too far at times (Barack Obama can almost constantly be either heard or seen, or his ambitions critiqued or praised), but it more often that not allows for Killing Them Softly, which ultimately suffers from a narrative that’s light on rewards and distinguished virtues, to elevate itself somewhat. Dominik’s style, meanwhile, is left to flourish elsewhere. He awards the film a melancholy texture that skilfully accentuates the lengths the men here have been lead to in order to make a living and maintain a durable masculinity without ever ramming the metaphors down audiences’ throats. His innovative, prevalent use of the camera (positioning and contrasting takes work wonders to stress dominance and weakness), along with an interesting exercise of music and slow-motion (used to particular avail in two scenes: one with Russell high on drugs and the other involving a horrific assassination). The performances are excellent across the board. 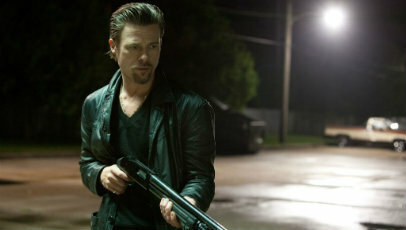 Pitt, perhaps his most watchable and stalwart in years, excels as the tough talking, indisputable Jackie, while McNairy and Mendelson are conceivably superb as the two brazen yet crucially unskilled crooks and the cause of the macabre eventualities. James Gandolfini and Liotta make remarkable impressions in their limited roles as washed-up veteran Mickey and consistently unlucky mob boss Markie, and Jenkins stoutly plays the man attempting to re-establish a sense of equilibrium. It’s acceptable to say that, while made by a filmmaker of extreme talent, Killing Them Softly doesn’t quite have the bite nor the discernible edge to properly invade the skin and invoke a strong reaction one way or the other. In its attempts to dispense comprehension to crime through social and political interpretation, it triumphs considerably, but unfortunately never truly finds the utopian balance between satire, dark comedy and full-blown thriller (it’s more dialogue-focused than anything else) to differentiate itself firmly.